Does your content marketing need an upgrade? If you’re like most content marketers, it does. Because many content marketers still struggle to get a positive return from their content marketing. And even the marketers who are getting good returns – they work hard for those results. In fact, one of the reasons they’re doing well is because they’re always on the lookout for how to do things better. Know why so many content marketers struggle? Well, because content marketing is hard. You heard it. I said it. Content marketing is hard. Rinse and repeat. Month after month. As more content gets created all the time. As your competitors get smarter, and there are more of them, and as you continue to compete with all the content out there. Remember: you’re not pitting your latest blog post against your competitor’s latest blog post for attention. You’re up against baby photos. Emails from long-lost friends. Travel pictures. Cat memes. But at least you’re not alone. Most content marketers are overwhelmed and short on time, too. So because content marketing is so complex, and so many marketers are doing it, it makes sense that we’re hungry for ways to do it better. Marketers are always interested in anything that can give them an edge. Even the tiniest little edge. So what about something that could totally change the game? That’s what content intelligence can do. Now, content intelligence is not gonna take your job. 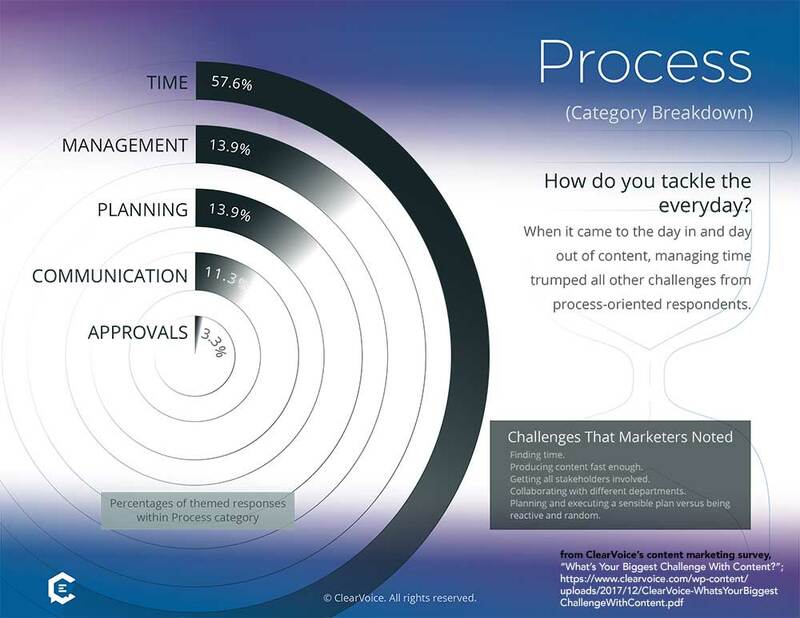 But there are plenty of content marketing tasks that content intelligence can help with. 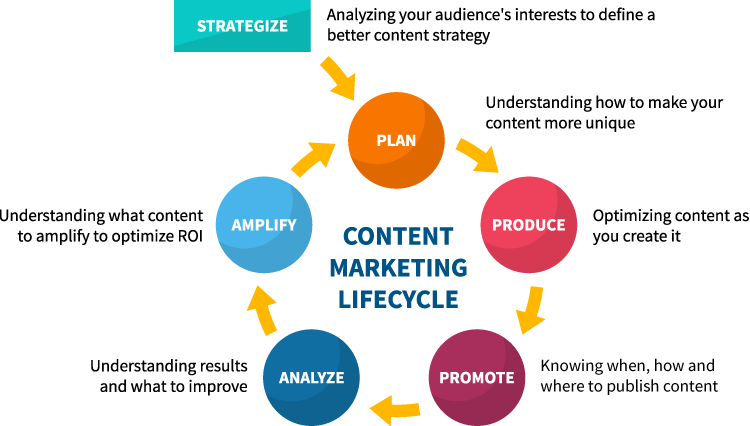 Every phase of content marketing can benefit from it. 1. Discover content to curate automatically. You know that you don’t have to create every piece of content you share on social media, right? In fact, it’s frowned upon. Sharing nothing but your own content makes your company look biased. Sharing about 80% of other people’s content actually gives you more authority. Or does it? There are several excellent content intelligence tools (like our own Scoop.it, but there are others) that can cut your curation time in half. And the best of these tools let you curate in very sophisticated ways… like by language, by content format, content length, content creator… you get the idea. So that’s one kind of content intelligence. We put a lot of effort into the content we create. Even a “simple” blog post takes several hours to write. 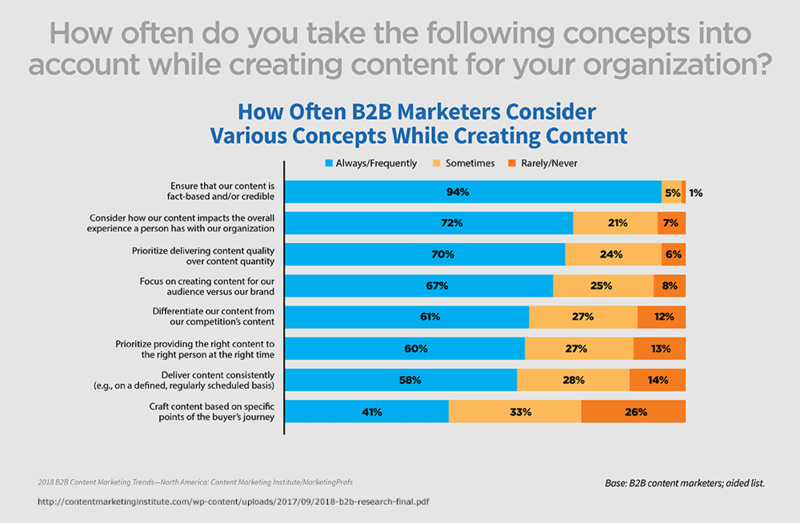 In that same study of content marketers, “generating ideas” came in as the fifth biggest challenge in all of content marketing. It beat out finding talent, generating leads, getting budget or even finding clients! But finding ideas and discovering possible new topics doesn’t have to be so hard. There are content intelligence tools available that can make it easier. This gets particularly interesting if you do competitive analysis. Seeing what’s worked or not worked for your competitors is a superb way to get the results of content “tests”… while somebody else foots the bill. And again, there are tools to help you do this. 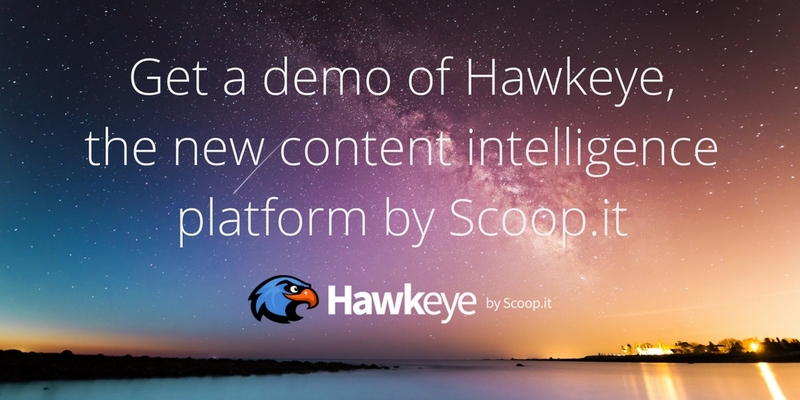 Our own Hawkeye can review your existing content and then show you how it compares with your competitors’ content. 3. Score and optimize your content before publishing it. A tool like Yoast can do this. It’s not quite full-scale content intelligence, but it’s smart enough. Or there are more sophisticated tools like Atomic Reach and Acrolinx. These tools analyze the content you’ve created and suggest how to make it better. Either to make it “better” by making it more readable, or better optimized for a given keyword, or better because the content fits with a specific phase of your buyer’s journey. Without tools for all this, it’s up to a human (and a well-trained human) to invest their precious time to make sure a piece is optimized before it gets published. With the tools, a human still needs to check things before publication, but they can do their work in 5-10 minutes instead of an hour. 4. Write analytics reports automatically. Do you relish the time you set aside every week to analyze how people behave on your website? 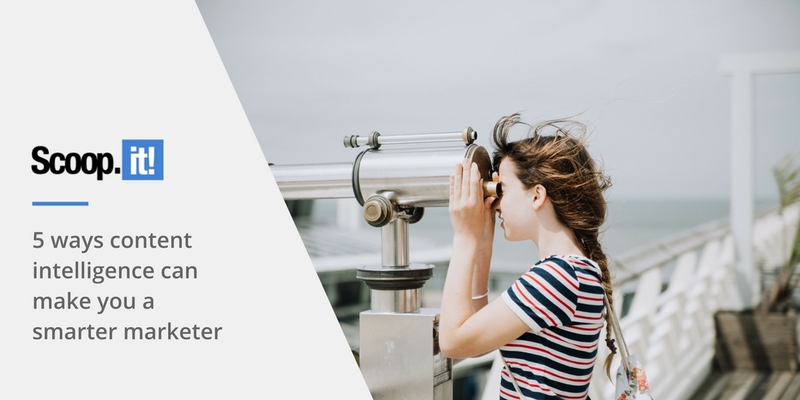 Do you look forward to any little pocket of spare time you can spend trying to find commonalities between your top-performing social media posts? Probably not … unless you have to. Of course, not everyone dislikes this sort of analysis and data crunching. Some people are natural data wonks and do indeed relish the time they spend crunching numbers. But many of us do not. Especially if we’ve got yet another deadline breathing down our neck, following closely by yet another deadline after that. And we’re assuming you have the SEO and analytics skills to do this work in the first place. Many marketers don’t. And so, enter content intelligence. Or a recent development in it from Google, called Analytics Intelligence. This feature lets you ask Analytics questions… almost as if you were talking to a human SEO. So you can ask things like, “Where is my traffic coming from?” and it will tell you. There are more and more tools that have similar functionality. The big idea behind this is that the software is getting smart enough so that we don’t have to wring actionable insights from it ourselves. The software is smart enough to discover insights itself. How often do you do a content audit? Every six months? Every year? We don’t blame you. Given all the other tasks on hand, finding time to do a content audit feels almost laughable for many content marketers. And yet, they know they need to do one. So what’s your idea of a content audit? Is it a complete soup-to-nuts analysis of every aspect of your content, or do you “just” want to know what’s working, and what’s not working, so you can adjust your work accordingly? Many people think of the soup-to-nuts version. And that’s why content audits have a reputation for being massive, month-long undertakings. While that used to be the norm, it is increasingly possible to do mini-audits in a day or two. Because… we have the technology. It’s possible to have a piece of content intelligence software do a continuous audit for you. You can see which posts are performing best in terms of traffic, leads, or links. And you don’t have to spend even 15 minutes getting to that data. It’s all just a click away, and you can even have it sent to your inbox every morning. Intelligent content systems really shine in applications like this, where they can easily handle dozens of variables at once and deliver distilled insights without ever getting bored, needing to sleep, or making a mistake. That means you can outsource at least some of your work every month to an algorithm. 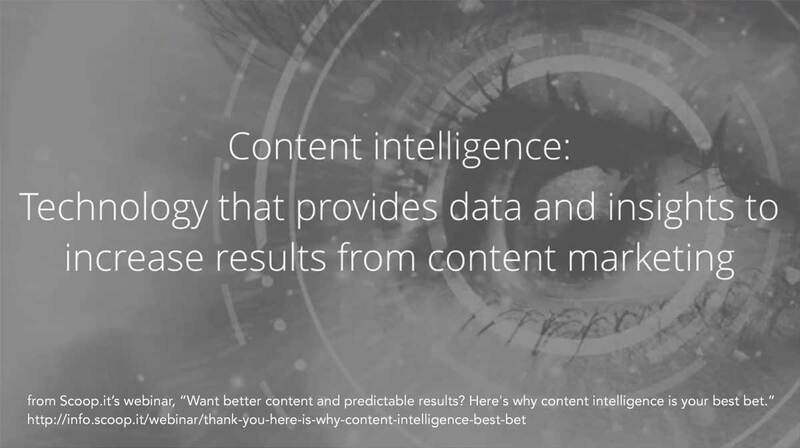 Using content intelligence in those five areas of your content marketing is a good start, but it barely scratches the surface of what’s possible. For instance, you know how chatbots are getting a lot of attention in customer service and e-commerce, right? And you know that there are a slew of tools that let people create their own chatbots? Well, why not a chatbot to answer blog post comments? Or respond to social media feedback? Even if the chatbot couldn’t respond to every question or comment, if it could handle half of them, that would be a big help. Or consider content promotion. That’s an area most content marketers badly neglect, and yet it’s become essential if you want to get exposure. So could your outreach be made more intelligent… if only by a little? Sure it could. There’s a tool called MailShake that can automate part of this work. There’s also Pitchbox, BuzzStream, and ContentMarketer.io. And what about making images that are the perfect size for each platform? Or a tool that formats social media posts so they’re optimized specifically for each platform? Or marketing automation, and all the possibilities it holds for automating when to send content, and which content to send it to? The possibilities are almost limitless. And every day, smart developers and entrepreneurs are dreaming up better ways to do our jobs. This doesn’t mean we marketers need to feel threatened. It means we need to think big. To see where the trends are headed, and how to keep our skills sharp for those new directions. Because even ten years ago, who would have thought this much content intelligence was possible? And ten years from now, who knows what we’ll be able to do?